"Inspired in Italy, Made in Canada"
Paese Ristorante has been serving Italian inspired food for over 25 years in North York. Owner and operator Tony Loschiavo was three years old when he moved to Canada from Southern Italy in 1965. Growing up with a passion for food and its preparation, Loschiavo’s early start in the restaurant industry was with two acclaimed Toronto restaurants of the time: Fenton’s and Noodles. In 1983, he founded L-eat Catering and in 1989 opened Paese Ristorante (Instagram: @paeseristorante, Facebook: Paese Ristorante). The L-eat Group cultivates a 3,000 square feet urban garden in midtown, producing fruits and vegetables used for their catering events, and everything from tomatoes and chili peppers for the chefs, to mint and lavender for the bartenders at Paese. 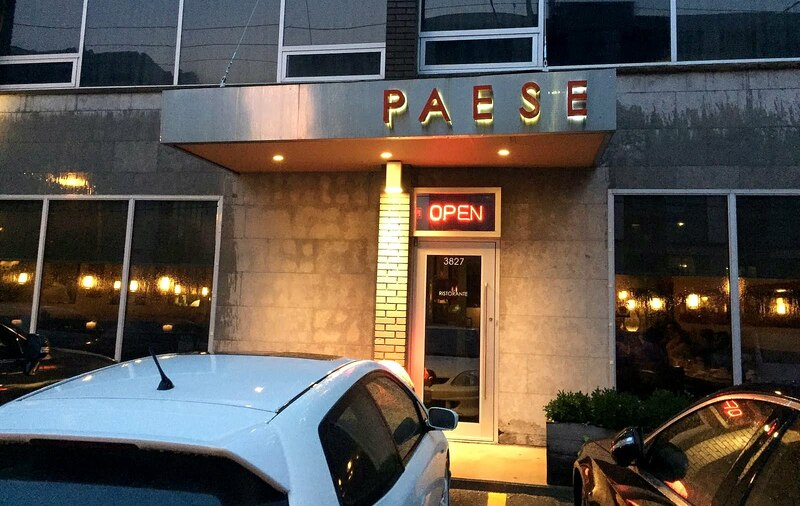 I visited Paese for some Italian cooking on a Saturday night. As usual, we started with cocktails. Tapenade made of tomato, roasted eggplant and red pepper. Paese's dinner menu features a selection of salads, antipasti, pastas, pizza, fish and meats, and sides. This was a marvelous appetizer, and it's no wonder that this dish is so popular at Paese. Coupled with an impressive presentation, the grilled octopus here is soft and tender yet still had good texture and chew. The creamy sauce and the hearty potatoes were perfect accompaniments to the octopus. I liked the size of the hand-chopped cubed steak. I thought the tartare could have used a bit more seasoning as well as an addition of a creamy element that would bind everything together better,..perhaps an egg yolk? With hardly any browning, this thin crust pizza could use more colour. It had a very pale hue throughout so it wasn't as visually appealing as it could be. The roasted mushrooms were nice and meaty, but the toppings overall didn't really blend together. Overall, I thought this pizza resembled more of a flatbread than a pizza. My friend really enjoyed it, though. Grilled whole fish. That dry, intense grill heat does wonders to the skin, making it crisp and crackly. Grilling also adds an extra dimension of flavour to the delicate meat. All you need is a a squeeze of lemon, anything more would ruin the dish. Our server de-boning the sea bream table-side. Hot espresso, cold and creamy white chocolate gelato plus a warm cookie. Yum. Enjoying a well-made affogato is one of the best ways to end your dinner. All-in-all, I had a very satisfying and delightful dinner at Paese. There were some obvious highlights for me - such as the Grilled Octopus, Whole Fish and Affogato - these plates I would recommend to anyone visiting Paese. Maybe next time, instead of pizza, I'll try their pastas (I was actually eyeing their Grilled Shrimp Linguini).